The Female Athlete Triad is a syndrome (collection of symptoms) that links 3 health problems: inadequate nutrition, irregular periods, and low bone mass. The teen years are in important time to develop strong bones. A healthy weight is needed to make normal levels of estrogen. 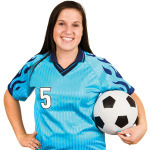 Most girls who play sports have regular menstrual periods, and girls who are very active may skip a few periods. However, some girls who train really hard and don’t get enough nutrition may skip many menstrual periods, or they may get their period at a late age, especially if they’ve lost weight, are not taking in adequate nutrition, or if they’ve developed an eating disorder. What is the Female Athlete Triad and what causes it? The Female Athlete Triad is a syndrome (collection of signs and symptoms) that links three health problems including: inadequate nutrition, lack of regular menstrual periods and low bone mass. Girls may begin to skip periods if they are not getting adequate nutrition for the amount of exercise they do (energy availability). Periods also may be irregular. Stress lowers estrogen levels, which may cause skipped periods. Low estrogen levels and a lack of menstrual periods can lead to low bone mass (low bone mineral density) and stress fractures (small cracks) in their bones. Inadequate nutrition: Inadequate nutrition means that your body is not getting enough energy from the foods you eat. Even eating regular amounts of food may not be enough for a very active person to maintain a normal weight. Some girls don’t eat enough calories throughout the day, and others don’t eat enough healthy fats. Healthy nutrition is needed to have regular periods and normal estrogen levels. If you lose weight, you are especially likely to skip periods. Some girls also have an eating disorder such as anorexia nervosa or bulimia. When a young woman with anorexia nervosa or bulimia exercises too much, she is putting an extreme strain on her body. Amenorrhea: This is defined as the absence of menstrual periods for longer than 6 months. This lack of menstrual periods can happen when there is significant weight loss, disordered eating, or intense training or exercise. A certain percentage of body fat is needed to maintain a healthy weight and strong bones. Girls will stop having their periods if their weight drops to an unhealthy level, or their nutrition is not balanced. Having your period every 2 to 3 months or very light periods is a sign that you are not taking in enough nutrients. A healthy weight is especially important for your body to make enough of the female hormone, “estrogen.” Normal levels of estrogen are important for your body to absorb calcium (a mineral your body needs to build strong bones). Low levels of estrogen can cause low bone mass. Low Bone Mass: This is when your bones are weaker than they should be. Although physical activity helps to build a healthy skeleton and strong bones, too much exercise can cause problems if you don’t have regular periods and normal estrogen levels. Everyone (teen girls especially) needs the right balance of exercise, body weight, calcium intake, vitamin D, and estrogen levels to have healthy bones. What health problems can the Female Athlete Triad cause in the future? Each of the three conditions (inadequate nutrition, amenorrhea, and low bone mass) are serious conditions that can cause health problems in the future and the need for special medical care. Even if you only have one or two of the conditions, it’s important to talk about them with your health care provider. For example, athletes may eat a healthy diet yet still skip menstrual periods and be at risk of low bone mass. Disordered eating can cause heart problems such as an irregular heartbeat, muscle weakness or fatigue, fainting, and loss of concentration with school work and athletics. Amenorrhea (no periods) is a sign that your body is not functioning properly. The biggest concern is that low estrogen levels may result in low bone mass. The teen years are the most important time in a girl’s life for developing healthy and strong bones for the future. Girls should add half of the bone mass that they will have for their lifetime during their teen years because very little bone mass is added after you are 20 years old. During your teen years, low bone mass and intense exercise can make it easier for you to get stress fractures. A stress fracture is a very small crack that can occur in bones when you do the same activity over and over for too long. For example, a runner may get a stress fracture in her lower leg or foot, and a gymnast may get a stress fracture in her spine. If you continue to do the activity in spite of the pain, the bone may break. How will I know if I have low bone mass? If you are skipping periods and your health care provider is worried about low bone mass, he/she may suggest that you have a test that can tell whether your bones have lost thickness or strength. One of these tests is called a DXA (Dual Energy X-Ray Absorptiometry) scan. It’s a painless test that uses low radiation waves to take a picture of your bones. The test results allow your health care provider to assess whether you have more or less bone mass compared to other girls your age. Who is at risk for the Female Athlete Triad? Athletes who do a great amount of physical activity are at risk for any of the three conditions of the Female Athlete Triad. Athletes who are very competitive or focus a large part of their lives on their sport are considered to be at a higher risk. Certain activities that involve a lot of endurance (such as long distance running) may put you at more risk for the Triad. There is also a higher risk among girls involved in activities that demand a thin physical appearance, such as gymnastics or dancing. Being aware of these demands or pressures on your body is a good first step towards keeping yourself healthy. It’s important to remember to balance your sports activities and nutrition. The right balance will keep you healthy. What should I do if I’m a female athlete? Give your body enough energy to fuel your performance. During sports seasons, make sure you eat a healthy diet with enough calories to make up for all of your training. Ask your health care provider: What is a healthy weight for you? Try not to lose weight if you are already at a healthy weight. Eat a balance of fats, protein, and carbohydrates. Make sure you get 1300 mg of calcium and at least 600 international units of vitamin D every day (through eating a healthy diet and taking vitamins) to keep your bones strong. Over-the-counter multi-vitamin tablets contain different amounts of vitamin D.
Keep a menstrual calendar. Use a calendar or phone app to keep track of when your periods start and how long they last. If you’re skipping periods, see your health care provider. It may be a sign that your body is under too much stress, or that you’re not taking in enough nutrients (calories). Don’t ignore injuries. If you develop the same pain in your leg or foot every time you run, the same pain in your back whenever you do gymnastics, or the same pain in any part of your body whenever you do the same activity, you may have a stress fracture. Be sure to get it checked out. Talk with your health care provider. If you are bingeing, purging, not letting yourself eat, avoiding fats in your meals, or worried about your weight a lot of the time, get help from coaches, trainers, and health care providers. While some problems may be hard to talk about, the earlier they are treated, the better. Taking part in sports is a great way to be active and to improve your health. As long as you take care of yourself and talk to your health care provider when you have questions or problems, sports will make you a stronger, fitter, and healthier person.